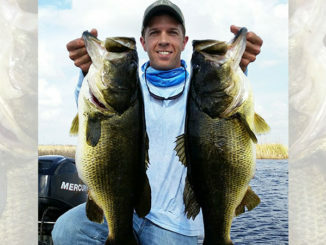 Brett Trouille, of Maurice, shows off the 10.03-pound largemouth he caught March 30 in the 12-15 area. The big bass, which was bedded down, bit a white Texas-rigged Zoom Craw. 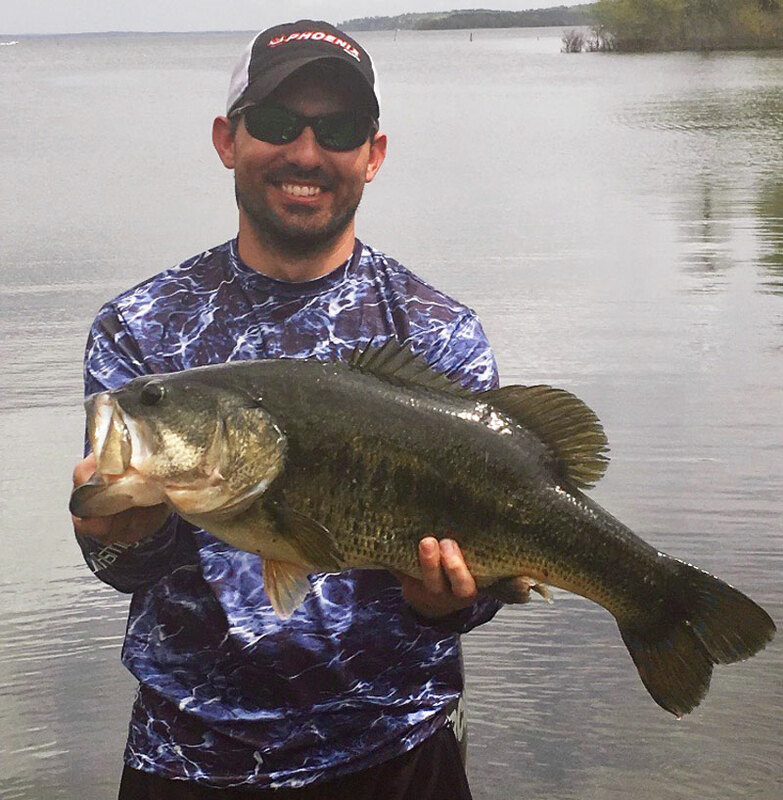 With an unseasonably cool cold front arriving early Sunday morning, March definitely went out like a lion — but pre-front conditions on Saturday produced two more nice lunker largemouth bass at Toledo Bend. 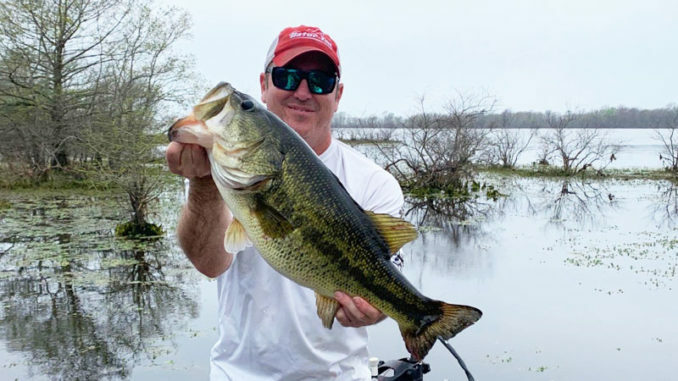 Brett Trouille, 40, of Maurice, got things started when he landed a 10.03-pounder in the 12-15 area with a Texas-rigged white Zoom Craw. Trouille had located the fish on a bed Friday afternoon, and returned Saturday to see if he could close the deal. Turns out he wound up with the biggest bass he’d ever caught. The fish was still in position when he arrived around 10 a.m. Saturday morning. The big fish tipped T-Town’s certified scales at 10.03 pounds, and measured 24 ½ inches long with a 19-inch girth. About 3 ½ hours later in the 6 Mile area, Brayden Cruze landed his personal best when he fooled a 10.72-pounder with a wobble-head rig featuring a green pumpkin Zoom Speed Craw in about 2 feet of water. This fish, like Trouille’s, also was bedded down. Brayden Cruze, of Ragley, poses with the big 10.72-pound bass he caught on March 30 in the 6 Mile area. 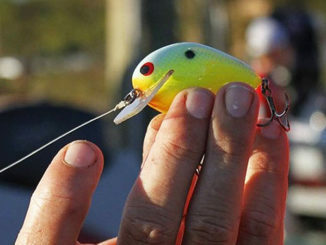 The bass, which also was bedded down, finally got aggravated enough to bite a wobble-head rig featuring a green pumpkin Zoom Speed Craw. The day was mostly cloudy, but the sun appeared briefly that afternoon, and Cruze said he put on his polarized sunglasses — which enabled him to spot the fish. “I stuck my Costas on and happened to see that bed and saw her on there. I had no idea how big she was, and we threw in there trying to get her to bite but she wasn’t having it,” he said. They pulled a nice male off the bed first, and finally got the big fish to commit after about 45 minutes. 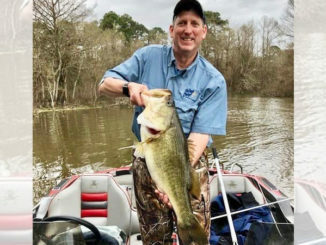 After landing the fish, Cruze and his partner, who were participating in a Calcasieu Parish Sheriff’s Department club tourney, fished for about another half-hour before heading to Buckeye Landing, where the big bass officially weighed 10.72 pounds, with a 25-inch length and 19-inch girth. 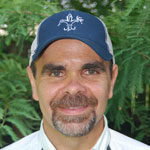 Both big fish qualified for entry into the Toledo Bend Lunker Bass Program, which awards anglers who return double-digit fish to the reservoir with a complimentary mount.